Talk with your doctor and ask any questions about how and when to take your medication. If you are unsure about what to do, call your doctor or pharmacist. Bring your medication to follow-up visits. Be sure to check your pills at the pharmacy for size, shape, and color. If you still have questions, you should call your doctor. If your doctor doesn’t write “Dispense as Written” (DAW)* on your prescription, then you may get a generic Divalproex Sodium Medication instead of Depakote. If your doctor chooses Depakote, ask that he or she writes “Dispense as Written” (DAW)* on your prescription, indicating that the “brand name” is medically necessary for your condition. to write Dispense As Written (DAW)* on your prescription. to make sure you receive the Depakote brand and to note your preference for future refills. 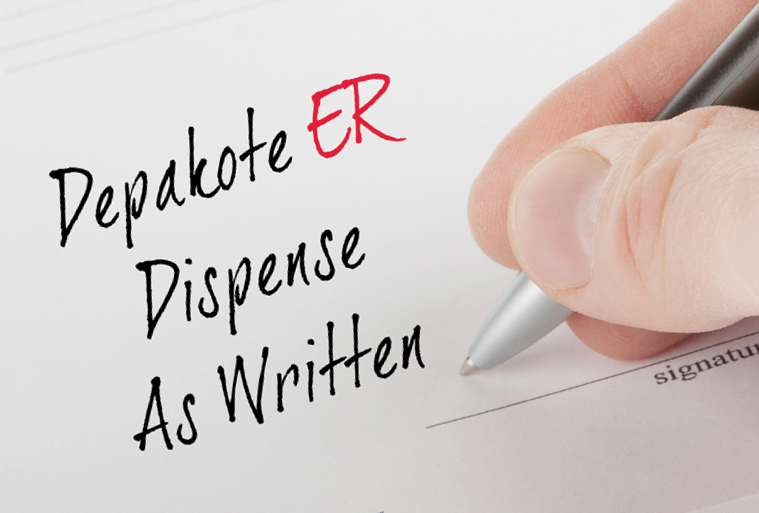 Ask your pharmacist to note your preference for the Depakote brand for future refills. Look at your pill bottle before leaving the pharmacy—make sure the bottle label states Depakote and the manufacturer is listed as AbbVie. Check your pills to make sure they are what your doctor prescribed. If it is a refill, they should look the same as your previous pills. Do not discontinue or change the amount you take, or how often you take it, unless directed to do so by your doctor. Speak up—if your pharmacist didn’t give you the Depakote brand, and you and your doctor wanted the Depakote brand, tell him or her not to substitute. If there are any problems with receiving Depakote at the pharmacy, call your doctor’s office. *Or your state’s legal language. †Up to $100/month savings for eligible patients.